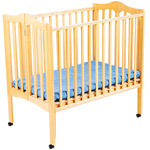 Our Bundle of Joy collection includes a Portable Crib, Travel System (Stroller & Car Seat), High Chair, Swing and monitors. All of the necessities for $23 less than our individual prices. Substitute items will be allowed.